With this year’s beautiful summer coming to a close it has once again come time to dust the backpack off and get back into school mode. I had an amazing experience working with the BIObus team these past few months and I’m glad I’ve had the opportunity to share some of that experience with all of you. Since this is the my last blog of the season, I’ve decided to make this blog about one of the coolest parks I’ve come across so far (which is also conveniently the one I’m sorting through at the moment). Kluane (Kloo-wah-nee) National Park is a 21, 980 km2 UNESCO world heritage site that lies in the southwest corner of the Yukon. If you’ve never been to that corner of the map, you might associate that area with no more than an unforgiving land of snow and ice. Although that wouldn’t be an entirely unfair association, Kluane is also home to a number of lush valleys, plants and wildlife with over 200 varieties of flora. Sprawling throughout the park, the St. Elias Mountains form two large mountain chains that dominate the landscape: the Icefield Ranges and the Kluane Ranges. In the Icefield ranges, the park boasts Canada’s highest peak: Mount Logan. Mount Logan stands at an unbelievable height of 19,545 ft (that’s as tall as an 1800 story building!). On the sides of these mountain ranges, moist air carried from the Pacific coast mixes with snowfall to create a heavy layer of ice. Over time, these layers of ice move down the mountain propelled by the immensity of their own weight. As they reach the base they form some of the many valley glaciers the Yukon is known for. 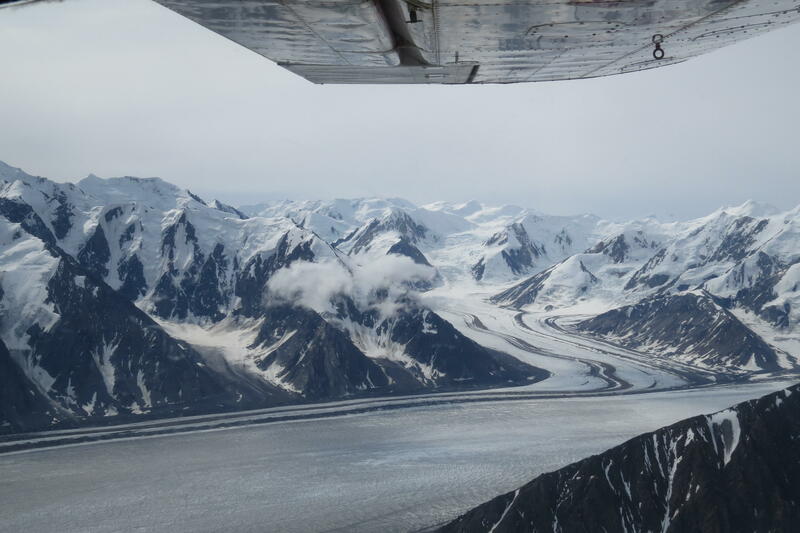 One of these such glaciers, the Kaskawulsh Glacier, feeds Kluane Lake – the namesake of the park – with freezing waters that pool and eventually drain into the Bering Sea. The name Kluane was coined by early European settlers combining the original names given to the area by the Southern Tutchone peoples (Lu’an Man meaning “big fish lake”) and the name given by the coastal Tlingits ( Uxh-ani meaning “whitefish country”). 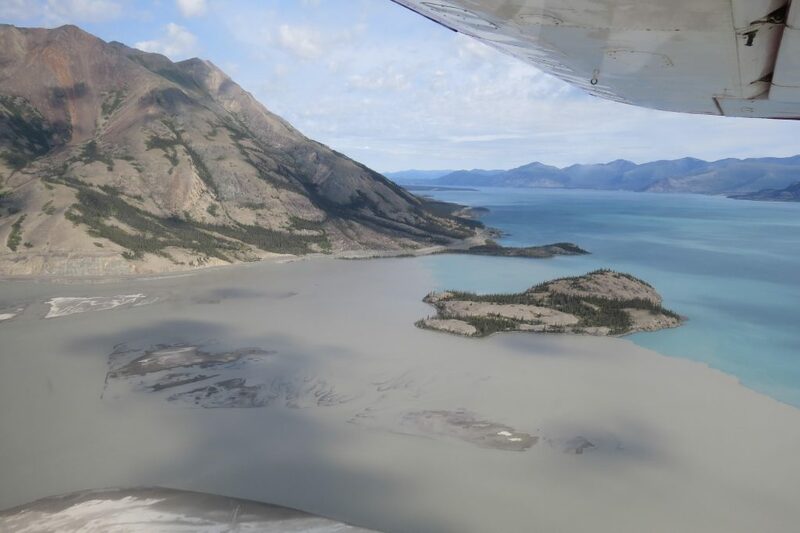 Kluane Lake – notice all the silt! Surrounding the lake the northern boreal forest provides shelter to grizzly bears, Dall sheep, woodland caribou and of course many insects. One thing I was surprised to learn when investigating one of the intercept trap samples collected in 2014 was how far north bumblebees can live. Some species of bumblebee have been known to inhabit areas as far north as Ellesmere Island in the high arctic. 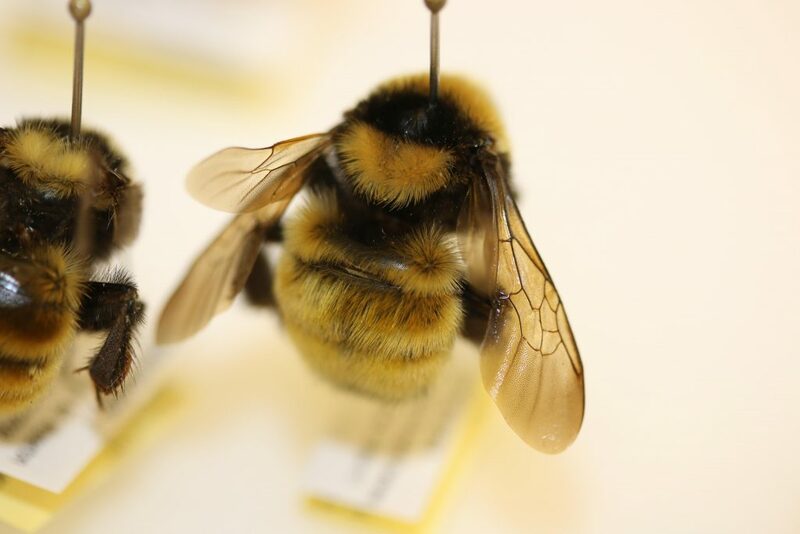 The last time you were visited by a bumblebee you may have noticed the thick coat of fuzz that covers their abdomens. This fuzz is actually a collection of something called setae which are bristle-like hairs. In cold weather it’s this coat that allows them to regulate their body heat and survive where other bees cannot. Surprisingly the only continent where bumblebees are not found is Australia with the exception of Tasmania where they have been previously introduced. Anyway, I hope this blog has been able to pique a bit of your interest in the wonders of the Yukon and I wish you all a safe and happy year! Approximately 24 Hours prior the start of the 6th International Barcode of Life Conference, a team of over 100 international scientists set off to survey as many species at the rare Charitable Research Reserve. Participants from 36 institutions and over 17 countries volunteered their time assist with collecting, sorting, identifying and plating. This bioblitz was unique due to the smaller scale and duration which was 12 hours instead of 24 hours, none the less, the results were impressive. The fish surveying team consisted of seven individuals. 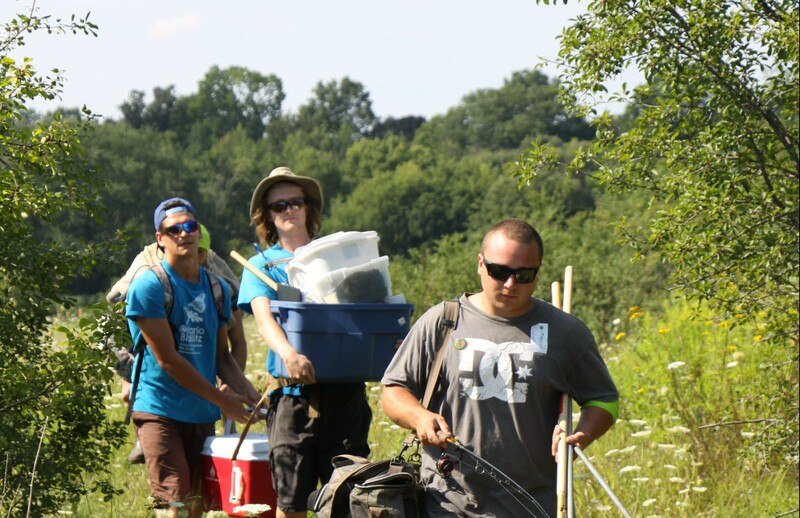 Equipped with angling gear, a seine net, cast net, and a D-frame dip net, we set off to sample Site 1 on the Grand River (Cambridge, Ontario). The site was an ideal fish sampling location due to the highly diverse habitats present in the area, which tends to correlate with the overall fish diversity. Of the habitats present in the river, the rocky (gravel and boulder), sandy, and silt bottom dominated. Heavy macrophyte growth was notable along the shoreline and the middle of the river in areas of persistent flow. We tactically targeted the fish in these habitats in order to increase the diversity of our catch. After several trial runs with the seine and cast net we got the technique down and gathered over 50 fish in less than 2 hours. The next task was to identify all of the fish caught; we placed them into larger buckets with freshwater to ensure they will have enough oxygen to be able to last the whole identification process. There were a few specimens that were very difficult to identify. We caught several fish from the family Cyprinidae, this family is notoriously hard to identify and requires a sharp and trained eye to distinguish between subtle characteristics of the individuals within the family. 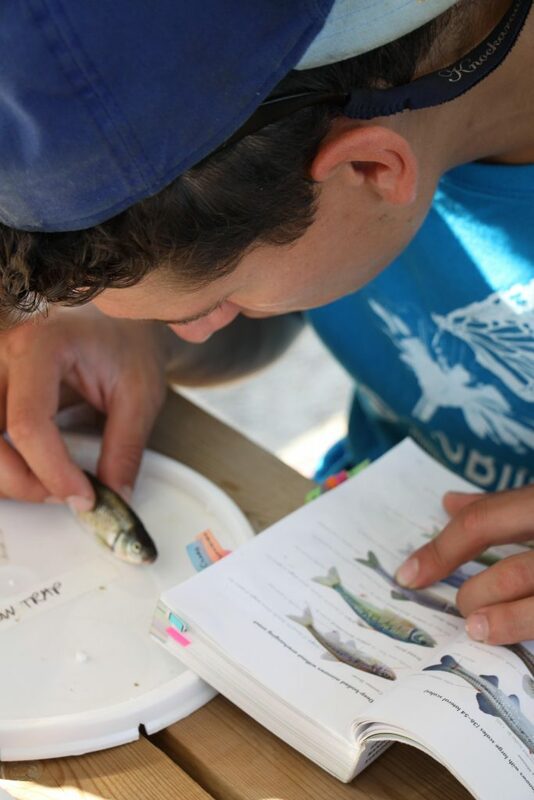 Our greatest identification challenge were a few specimens from the Cyprinid family, due to so many shared similar characteristics we weren’t able to determine if we had caught a Common Shiner (Luxilus cornutus), Striped Shiner (Luxilus chrysocephalus), or a hybrid of the two. Common Shiners and Striped Shiners frequently hybridize, adding to the challenge of being able to accurately identify the specimens. Due to the uncertainty, we are waiting on a confirmation from an expert. A notable collecting limitation was the type of seine net we utilized, which was very small (3 m) and lacked a ‘collecting pouch’ that funnels all the fish into the pouch with the assistance of the current instead of letting the fish to escape out the sides. Due to this limitation, the number of fish collected was lower and we weren’t able to collect the elusive catfish (Ictaluridae) – they successfully evaded all our nets that day. Since were unable to catch it and identify it under close inspection, we could not include it to our total species count. The predominant invasive species which encountered was the rusty crayfish (Orconectes rusticus), this aggressive and hardy species of crayfish outcompetes all of the native crayfish which resulted rusty crayfish’s population numbers to explode all over the northern US and Canada over the past 50 years (Image 3). Here is an informative website about the rusty crayfish in Ontario and how to identify them (http://www.invadingspecies.com/invaders/invertebrates/rusty-crayfish/). 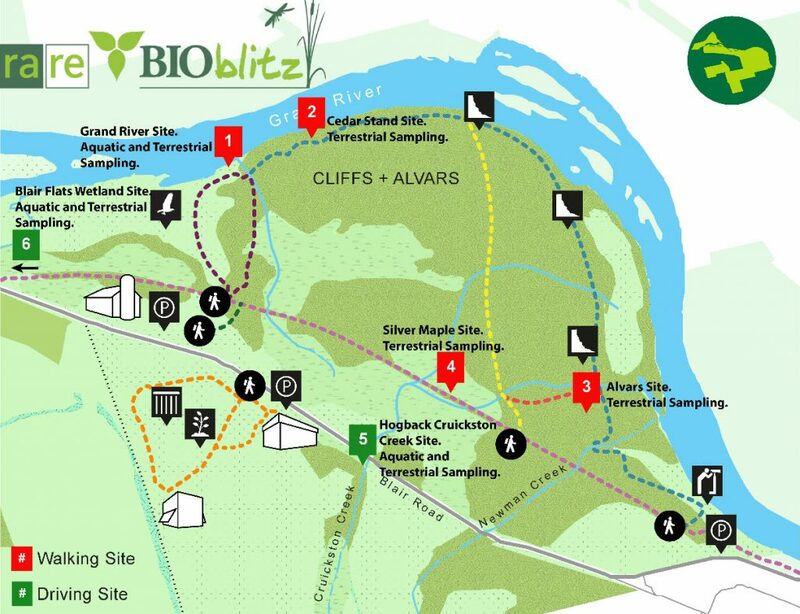 The results from the rare Bioblitz were impressive; including an initial four month survey of the area; a total of 1,100 species of animals, plants, fungi and lichens with 181 species of spiders were added to the nature reserve’s inventory. This increased the rare Charitable Research Reserve’s inventory of cataloged species by 49 percent. The results of this survey can be found here. You can also watch a short video of the rare Bioblitz here.